New pedal boasts vintage Seventies-style fuzz circuit. 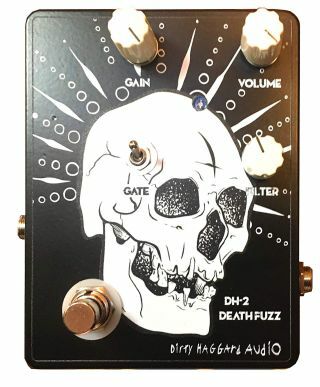 Portland, Oregon-based Dirty Haggard Audio has unveiled the DH-2 Death Fuzz pedal. Sporting a circuit based on the coveted Sevnties Shin-ei Companion FY-2, Dirty Haggard touts the new unit as an “over-the-top gated fuzz” with a virtually silent noise floor. Features of the Death Fuzz include a unique filter control which focuses on low-mids and highs, switchable noise-gate, aggressive power-supply noise filtering and two-stage radio-frequency rejection. The DH-2 is hand-built and available for $155. For more information or to purchase, head over to at DirtyHaggard.com.